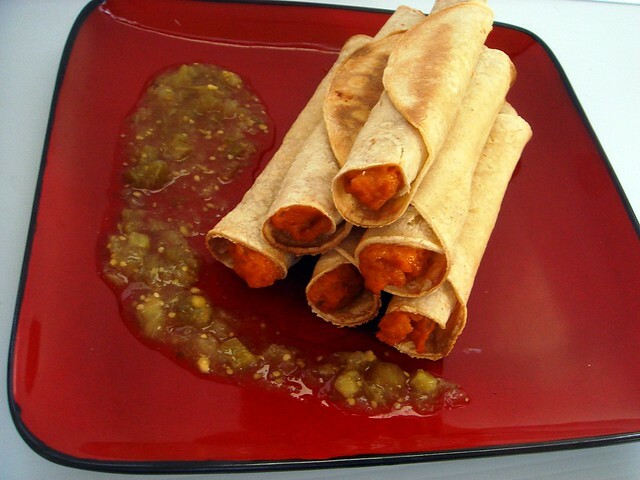 One of my favorite snack foods are those frozen taquitos. I bake them and dip them in queso, then stay up late and watch movies. I haven't gotten them in a while and they aren't something I've attempted to make before. 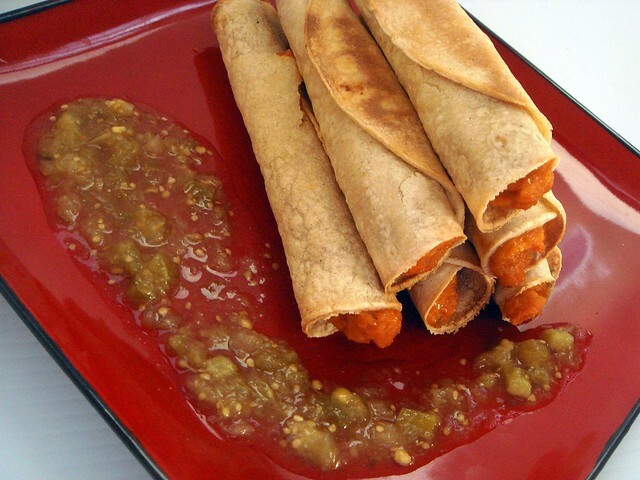 When I saw a contest featuring sweet potatoes put on by North Carolina Sweet Potatoes, I thought that a savory sweet potato filling inside a baked toquito would be a unique and healthy alternative. The filling is simple and cooks in about 25 minutes. All that's required are sweet potatoes, onions, garlic, seasonings, and cheese. The festive Mexican flavor is from the oregano, cumin, and a packet of Goya seasoning. I like this seasoning because it gives foods a different taste. My favorite is the Sazon with Coriander and Annatto. You can locate Goya in the Mexican aisles of grocery stores. Aldi's had their own version so that's what I used here, but it's pretty much the same thing. 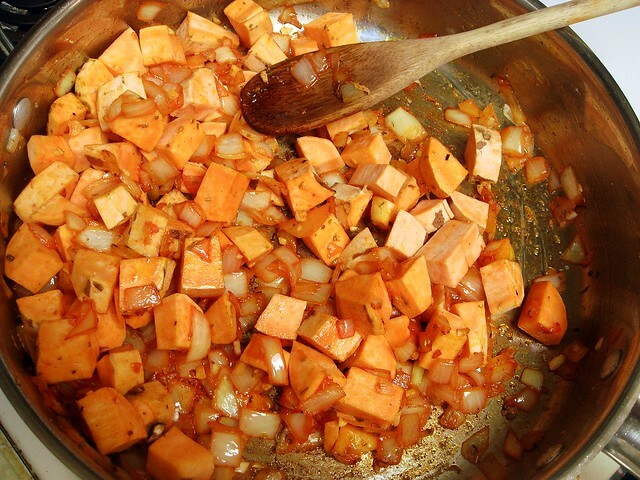 Once you add the sweet potatoes and toss them in the seasoned onions, I added a bit of water, covered the skillet, and the potatoes cooked away until very tender and soft. Since I sliced them into small, 1/2 inch pieces it took about 15-17 minutes to cook. It tastes great! 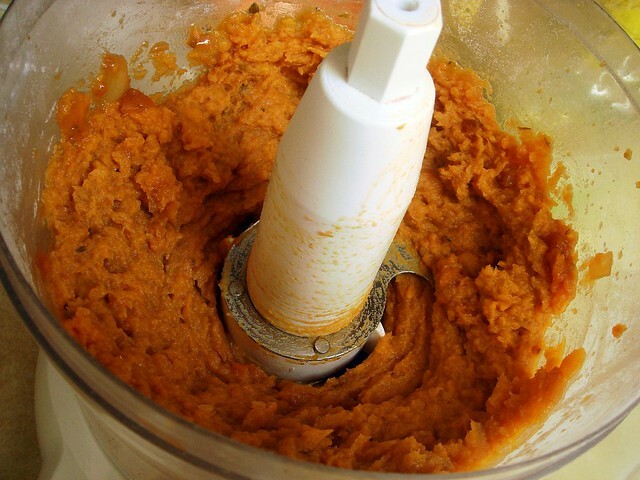 After the mixture cooled down, I processed the sweet potatoes to a smooth consistency. I then transferred it to a mixing bowl and stirred in cheddar cheese. The number one problem you might encounter when working with corn tortillas is that they'll tear as you try to roll the taquitos up. 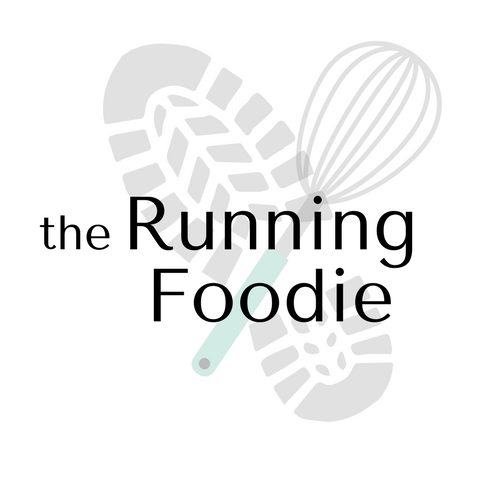 The solution is one I learned from watching Rick Bayless on his show. He brushes both sides of the corn tortilla with oil (I used cooking spray) and puts them on a baking sheet to soften in a warm oven. This only takes about 5 minutes or so. You can stack them up all at once, though you might need to add on a few minutes. 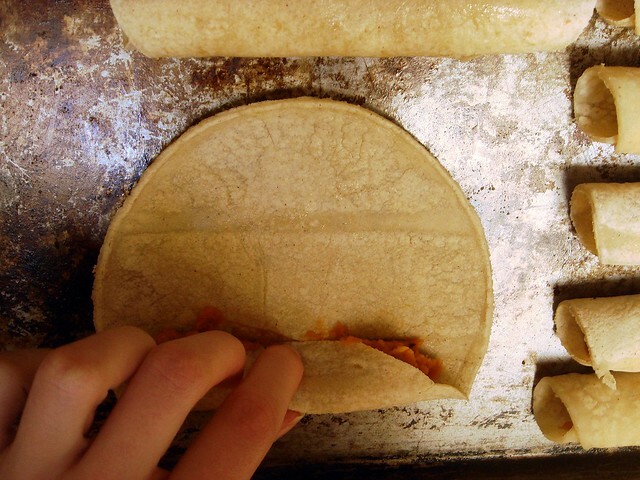 Since the corn tortillas are soft and pliable, they hold the roll without unraveling. Because the corn tortillas were lightly brushed or sprayed with oil they'll cook up to be crispy and a bit browned. Much easier than frying! 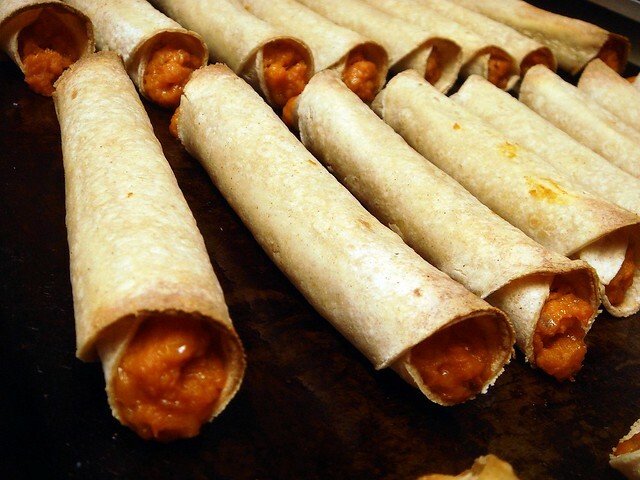 To roll these up tightly, press the first roll in on the filling. Continue to roll the tortilla in on itself with each turn. I hadn't been thinking or else I would have taken a video to show you how, but I will advice you to Google "Seinfeld crepe cuban cigar YouTube". 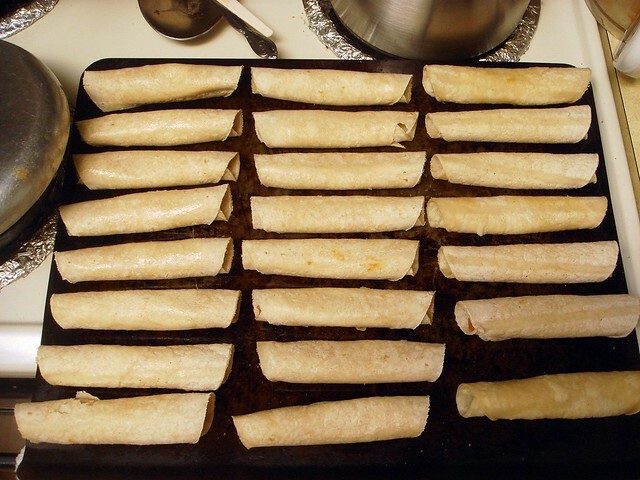 Once you get a tray of tasty taquitos, it's baking time. Mmm. Crispy and crunchy with a savory sweet potato filling. These were enjoyed by everyone, even my mom (who didn't think she'd enjoy a meatless version). I tested this recipe out again, but using ground turkey in the filling (which caused me to use about 45-50 corn tortillas). The taste was consistent and was just like before, though the turkey wasn't prominent. I've found that turkey blends with flavors well without giving the dish a meaty taste. I'm entering this recipe in their kid friendly category. Kids like snack food, and growing up my mom always looked for unique ways to use vegetables in recipes. If your kid is super picky, just tell him there's cheese! Also tell them that they can use their hands (I'm not sure if I cared about this, but who doesn't like playing with their food). Give them a try the next time you're cooking up Mexican food, or a healthy snack for movie night. Preheat oven to 275 degrees. In a large skillet, heat olive oil over medium heat. 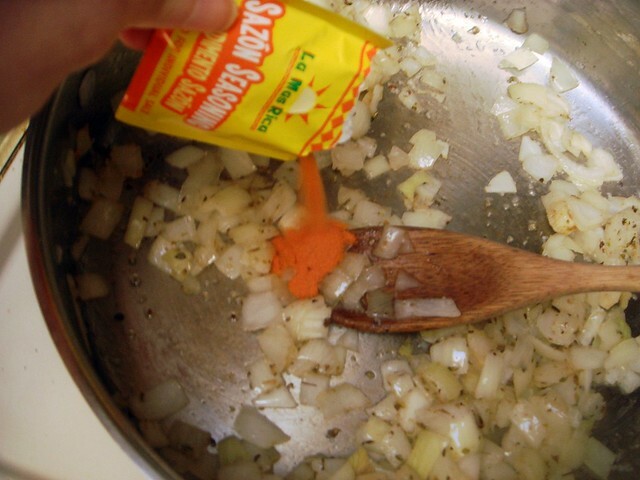 Add onions and cook for 3-5 minutes, or until beginning to turn translucent. Stir in Goya, oregano, salt, and cumin, followed by the garlic. 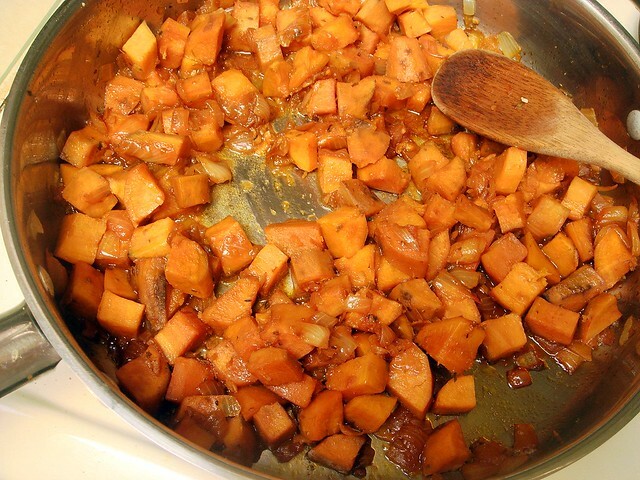 Add sweet potatoes and stir to coat in onion mixture. Cook for a minute. Add water and bring to a boil; lower heat to medium low, cover skillet, and let cook until sweet potatoes are tender, about 15-20 minutes. Uncover skillet; raise heat to medium and cook for 3-4 minutes, just until most of the liquid has evaporated (you want a bit of a thick liquid remaining). Remove from heat and let cool. Meanwhile, line a baking sheet with corn tortillas. Spray both sides lightly with cooking spray. Continue process, stacking corn tortillas on top of each other and place sheet in the oven. Warm for 5-7 minutes, or until tortillas are soft and pliable. Remove from oven and place tortillas in a covered dish to keep soft. When mixture has cooled, transfer to the bowl of a food processor. Puree just until smooth. Remove to a mixing bowl and stir in cheddar cheese. Set aside. Increase oven temperature to 450 degrees. Working with one corn tortilla at a time, spread a bit less than two tablespoons sweet potato mixture along the bottom edge. Tightly roll up and place, seam side down, on a baking sheet. Repeat with remaining potato mixture and tortillas. 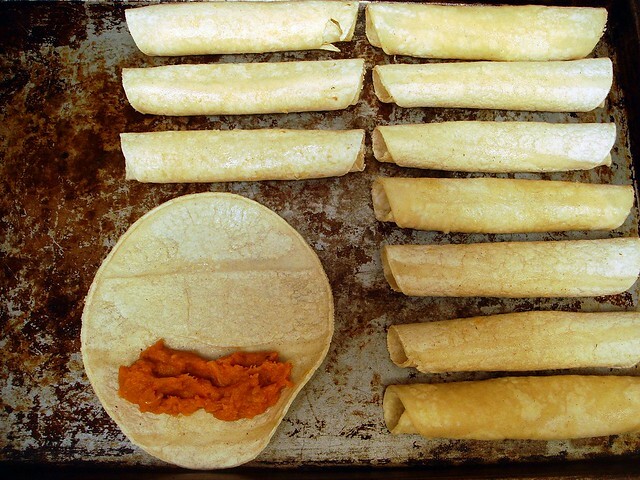 When all the tortillas have been rolled, bake the taquitos in the oven for 15 minutes, until crispy and browned. Let cool slightly, then serve with your favorite salsa. this sounds delicious!! i was just staring at my sweet potatoes thinking "wth am i going to do with you!?" i'll do this for sure - you always know just what to post! no frying!!! be still, my heart! these were awesome.....but if you made 45-50 how did I only get 5?? Next time I will hide a few. I'm up for anything involving sweet potatoes and these look amazing!! Who would have ever thought?? These look great but is there a seasoning option instead of the Goya? That contains MSG, food coloring and preservatives in it. I think I will omit that part but thanks for a great recipe! Anonymous, don't you think the Japanese have been through enough recently? Maybe you should support them instead of attacking their culture. PajamaChef - They don't taste as grainy and dry when they're crispy like they do otherwise. I always have to really warm them up. Sues - Thanks! 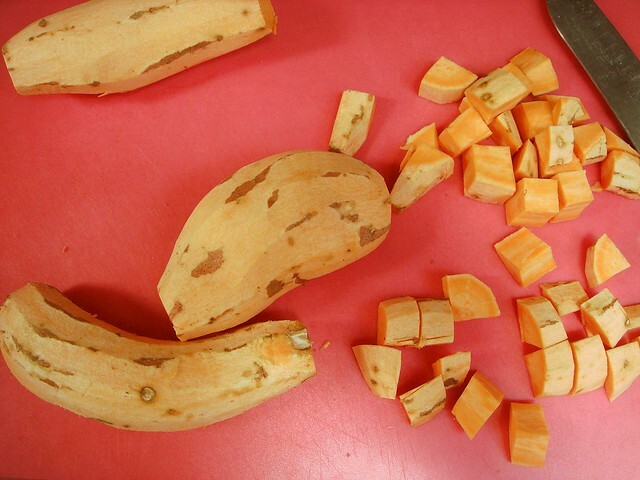 I've been enjoying incorporating sweet potatoes in different ways. Anon 1 - MSG is actually a naturally occurring product discovered by the Japanese. However, Goya also makes a selection of natural & complete seasonings you should check out. Anon 2 - The tension here, it's radiating. Thanks Christina I will look into the Goya natural. I tend to not use prepackaged spice mixes due to the additive in them for preserving. Just a personal choice. I am aware of where MSG comes from I just choose not to eat it for personal health reasons. I didn't realize that asking about an ingredient substitution would cause someone else to post their opinion of my simple question as an attack on the Japanese culture. My husband is half Japanese so I highly doubt I would ever disrespect him or his culture. Sorry someone had to post something nasty on your blog. Those look incredibly delicious! Great idea. I've entered the same contest too. Best of luck! oh my gosh! I LOVE these--I can't wait to make them! I added jalapeno & poblano peppers because I happened to have them on hand and my family likes spicy stuff....they are delish!!! Nice twist with the peppers! It would taste great with the spiciness.